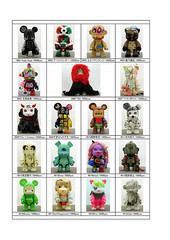 The Toy2R Expo has made it way to Japan at Few Many in Tokyo. For this stop, a collection of custom Qees from Japanese artists will be sold to support the Toy Saves Children charity event; 50% of the proceeds will be donated to the Unicef fund for children. The very affordable prices range from 10,000 to 20,000 yen (roughly 100 - 200 US dollars). If more than one person chooses to buy a particular piece then a raffle will decide who gets to purchase it. There are some amazing pieces in this collection. The variety is pretty impressive and high quality throughout. I was going to pick out faves but there were too many that caught my eye. Enjoy 'em! Collectors in Tokyo should have a great time with this event!